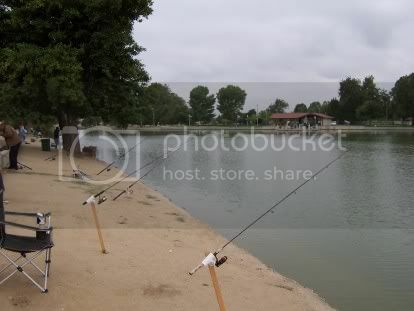 Cucamonga-Guasti Park is stocked every Thursday during the Winter and Spring with rainbow trout and every Wednesday the rest of the year with 1000 lbs. of channel catfish. Fishing is best right after the stock and Friday is the best day to avoid the weekend crowds. The lakes also have a decent carp population as well. Fishing permit: $5.00 per person (8 years and older) (Mon - Thurs) $7.00 (Fri - Sun); $2.00 per child (7 years and under) (Mon - Thurs) $4.00 (Fri - Sun). Fishing permits must be purchased at the entry gate each day and be in the angler's possession while fishing. Permit is valid only at the park where it is purchased. Turn in the permit at the gate when leaving the park for the day. California fishing license is also required to fish.